… and a view of a small area of our little garden that I began work on when I retired in February of 2010. 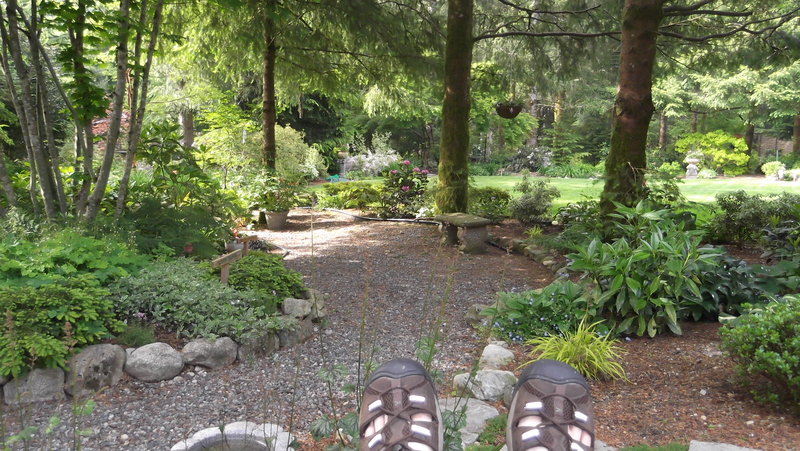 It’s so peaceful sitting in the area of the back yard we re-landscaped last year. The rhododendrons and azaleas are still smallish but everything is so lush and nearly always there’s a serenade of scores of birds feeding in the nearby maple. Life is good. It was back to Druid’s Glen again this morning. This time I began the round on the back nine and once again got off to a feeble start going double bogey, bogey, double bogey. Despite getting par on both par 5s I added two more double bogeys to hit the turn at 47. But I hung in there finally scoring four consecutive pars on holes 5 through 8 to finish the front nine in 42. So in spite of mediocre ball-striking and so-so putting I still managed 89–a big moral victory. 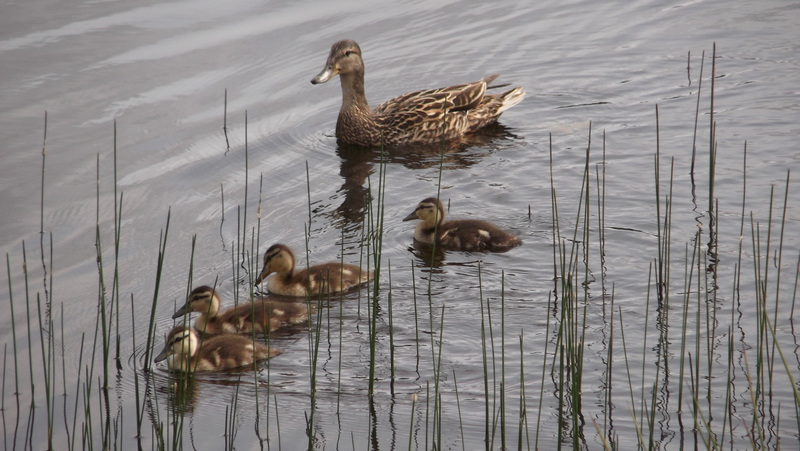 And I got to see lots of ducklings, especially at the par 3 3rd hole. 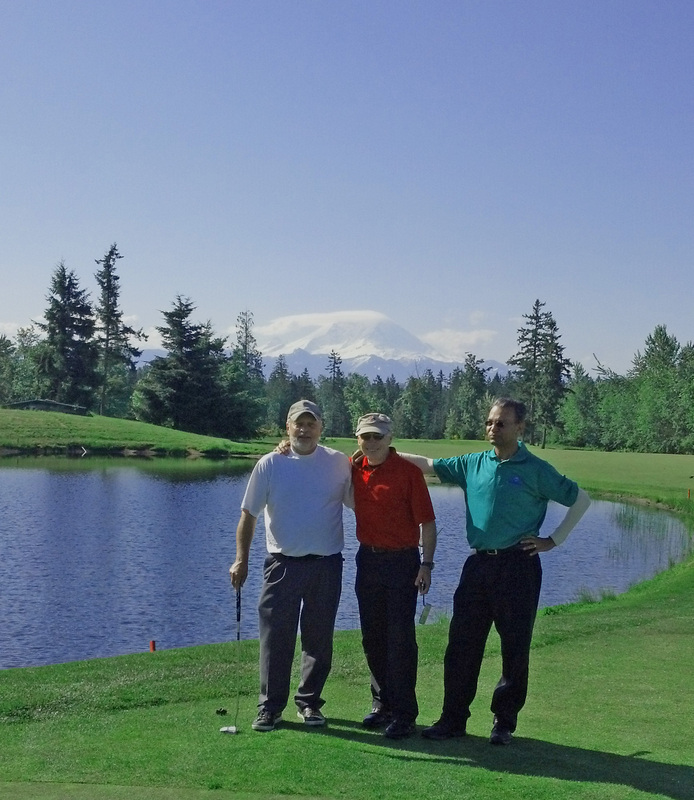 Three of my former Microsoft golf team buddies suggested we get together for a round to celebrate my birthday. So I was up early for a 7:06 tee time at Druid’s Glen. What a spectacular morning. A light fog still hovered over the various ponds, deer bounded across the practice range and Mount Rainier loomed impossibly clear. After a shaky start –six over par after three holes– I settled down, finishing the front nine with a 34-foot birdie putt. I ended the morning with a satisfying 89, my best score at Druid’s with it’s 134 slope rating. It’s the first time I’ve broken 90 on a course with a slope rating of 130 of higher. 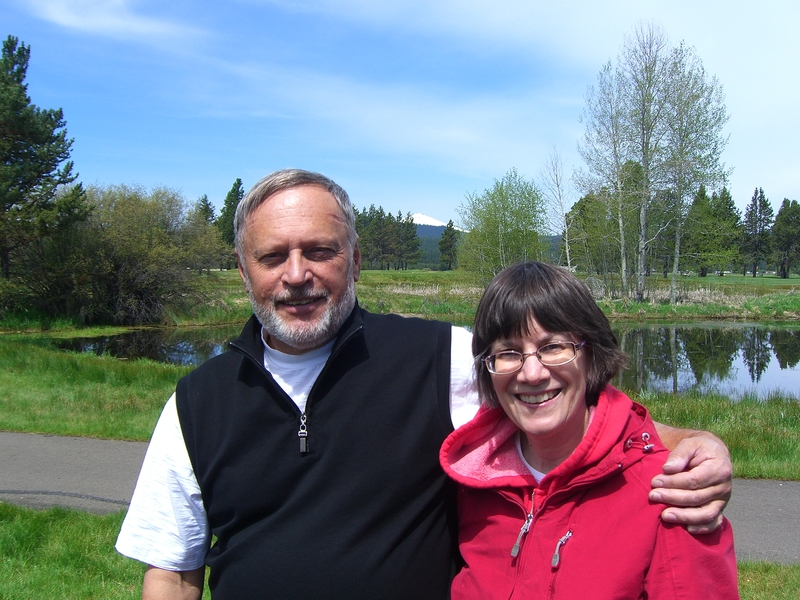 My 65th year began with an hour massage at the Sage Springs Spa in Sunriver after which I baked in the steam room and soaked in the gigantic whirlpool tub. We had planned to drive to Crater Lake for the day but the north entrance is still closed with winter snow. With the Sunday forecast for rain we decided to head home this afternoon instead of tomorrow morning and enjoy the mountain scenery between Bend and Salem in the sunshine. En route we scoped out Black Butte Ranch for a possible fall visit and stopped briefly in Sisters. A very chilly morning led to a 45-minute frost delay. However, that worked out because I cajoled Trisha into riding along for the first nine holes. It was another spectacular morning and with Trisha’s excellent coaching I shot a very steady 42 on the front nine. After that, I have no idea what happened. I couldn’t do anything with any club and ballooned to a 55 on the back, my worst nine-hole score in over 100 rounds. We took an afternoon drive up the the Mt. Bachelor Ski Resort then had dinner at Greg’s Grill in Bend (very good). I’m looking forward to a luxurious massage tomorrow morning at the Spa. I was anxious to test a new course, one slightly more difficult than my home track at Mt. Si. 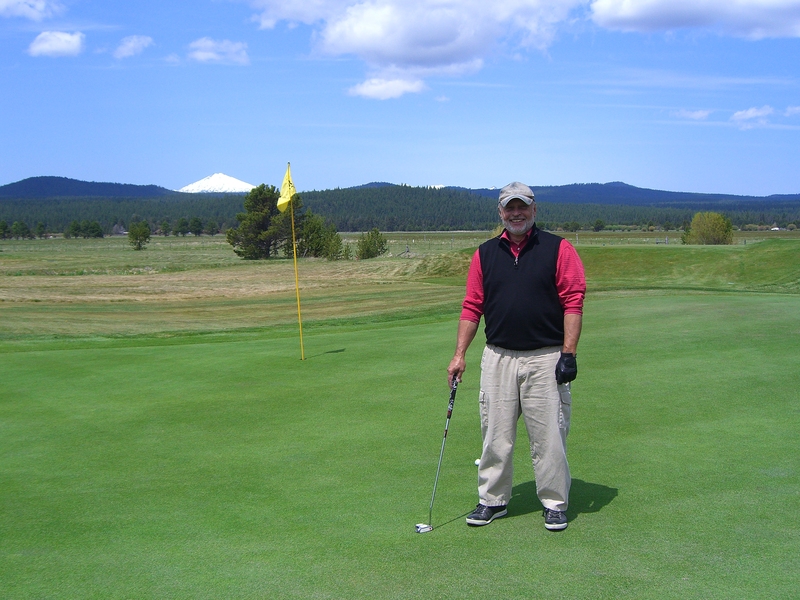 The Meadows course at Sunriver wasn’t in great shape yet since the last snow had melted just a couple of weeks ago. But it was a delicious morning; perfect really. I had pretty much the best of High Desert golf: snow-capped mountains in the background, hard fairways and thin air at 4,300 feet elevation. I had a steady albeit unspectacular round ending with an 87.